I wasn’t intending to give up drinking alcohol forever, but somehow that’s what happened. And this is Day 50 as alcohol-free Lisa. 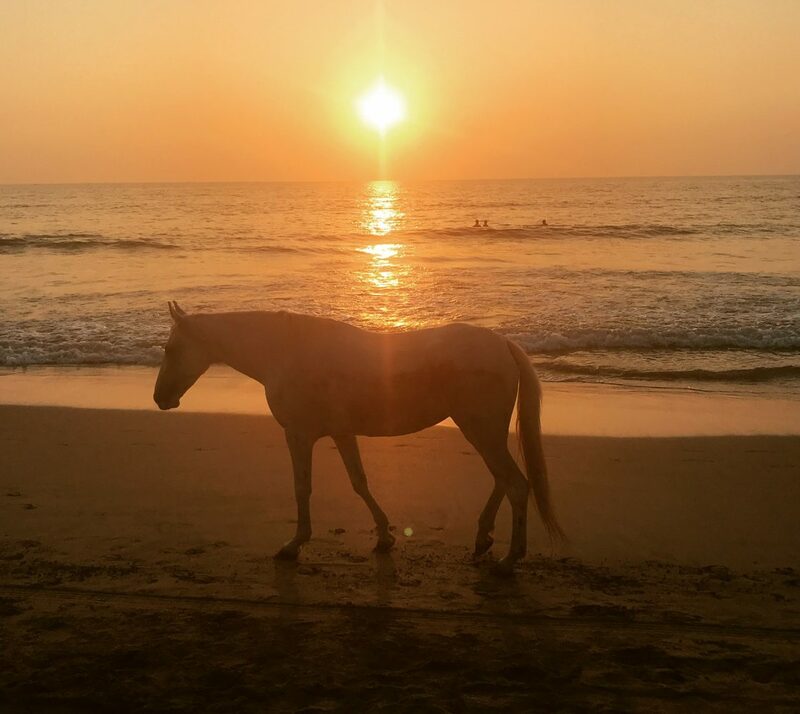 I am almost annoyed that I haven’t said goodbye properly, or had one last blast – although I did, on the last day of my Christmas holiday in Goa. I just didn’t realise it at the time. Like many people my age, especially women who came of drinking age in the ‘90s ladette culture, I’ve been toying with the idea of cutting down or stopping drinking for a while. Last year I joined online forums where people discussed it and I paid particular attention to feature articles talking about it – so much so that algorithms started supplying me with more and more to read. At first I congratulated myself for increasing my non-drinking days to three, four and eventually five days a week. I even got to eight days at one point. I’d go out once or twice a week and know that I was going to blast through a bottle of prosecco. I couldn’t seem to stop at one or two glasses – I had to keep going. I was a binge-drinker. I admitted that to myself at least. But I excused myself too. I watched the Adrian Chiles drinking documentary on the BBC, and thought, “at least I don’t drink that much”. I’d started tracking my drinking on an app and being truthful about it. With my one or two days per week drinking I wasn’t exactly a raging alcoholic, but I was at least double the recommended 14 units per week for women (Chiles was well over 100 even when he’d cut down). I kept coming in at ‘increasing risk’ on the health-monitoring part of the app but I so wanted to achieve ‘low risk’ status. By the time I went on holiday to Goa at Christmas, I knew I didn’t want to spend every day waiting for cocktail hour (which I’d done the year before). I was mildly ill for two days which meant I couldn’t drink, and decided I’d stick with it to see if it suited me. It did. I was going to bed early and getting up early to play with the dogs on the beach and go to yoga classes. I liked the way I felt in the morning. I wasn’t annoyed and anxious. I was smiling and friendly. People smiled back a lot. On a few nights I had a couple of cocktails and regretted it as soon as the second drink touched my lips. It just didn’t seem to contain the same joy it once had. And it spoiled my beautiful mornings. I went back to drinking nothing. Then came the last night at my favourite bar and I went for it. “I’m on holiday!” I thought. I spent two days after the flight recovering. But, dear reader, I stopped as soon as I started reading the book. It was instant. No looking back. Seriously – this book should come with a warning sticker. It promises to resolve any cognitive dissonance you may have around drinking – your conscious brain telling you you don’t want to drink and your subconscious telling you you want a drink very badly. In summary, it works by telling you the science behind your cravings and what alcohol actually is and what it’s doing to your body. Now I know what I know, I can’t go back. It’s very weird – I seem to have known all along that alcohol is a highly addictive drug, but I also didn’t. I also seem to have known it was toxic, because your body rejects it and hangovers happen – but I also didn’t know. When I was on holiday in Goa I read an article that described alcohol as a ‘toxic depressant’. Those words really struck a chord with me, even to the point that later that evening at the bar, I ordered “a glass of your best toxic depressant, please!” in my head. But it is. It was a depressant for me. I didn’t know that it was the alcohol that caused it. I thought drinking helped feelings of anxiety and worry but in fact it created them and then pretended to resolve them. I didn’t know that the happiness I felt when I picked up that first sparkling glass of prosecco wasn’t the effect of the alcohol – it was the impending satisfaction of a deep craving. A craving that had got worse and worse as the years went on and the addiction grew. There is a reason why people around my age are struggling with their drinking – it’s because we’ve built this addiction up over decades. Although never tipping into full alcoholism as some do, it started to become something we needed and depended on. Anyone who opts out is eyed with deep suspicion. “I don’t trust anyone who doesn’t drink,” we’d say. I said that. I said it last year. I’m horrified at myself now I know what I know. I wish I’d never touched a drop because I never needed it. Well, my body never needed it but the pain in my heart did. I now know that I drank to self-medicate – to numb the pain of existence. I can almost trace the journey back to that moment in the ’90s when my mum was on a downward trajectory with dementia and I’d already lost my dad. I couldn’t wait to get home to the wine in my fridge each night. I didn’t connect the two things until now. Once the pain had been dealt with during therapy last year, the reason to anaesthetise disappeared. I knew I didn’t need to do it any more. The book simply gave me more ammunition – it confirmed what I’d subconsciously known all along. Alcohol is not good for me. It’s not good for anyone. What’s crazy is that I’ve always prided myself on opting out of substances that are harmful to me, even if they’re socially condoned. I’ve never smoked, I’ve never taken drugs apart from one puff on a special cigarette, and I don’t take the pill because it makes me suicidal and not ‘the natural me’. Turns out I was never the natural me under the influence of alcohol either. It takes ten days to fully leave your system. Ten whole days. Which means, in reality, it never really left. I can’t believe I’ve been in the grip of this addictive poison for over twenty-five years, ‘enjoying’ something that is hugely carcinogenic whilst simultaneously feeling smug that I’m not a smoker. In sobriety, I’ve rediscovered someone I used to be years ago. I remember this clear-headedness and this ability to smile at people and not feel annoyed about everything. It feels as though I’ve gone from a pixelated screen existence to hi-definition. This is me at around 25, almost 27 years ago. I could cry when I think of all that time wasted. I can’t say I regret everything I’ve done after having a drink – some of my best friendships have been forged in the pub and some of my best lovers have been met at pubs, clubs and parties. I have done bad things as a result of drinking, like proposing to a man that didn’t love me, but also things I’ll never regret. But now, at this stage in my life, my relationship with alcohol is over. We had good times, we had bad times, but we’re done. In the first few weeks it did feel like a mourning period, looking back on those sparkling moments through rose-tinted glasses (which I now know is a thing called Fading Affect Bias or FAB). There is also a thing recovering people call the Pink Cloud. In the early alcohol-free days your body and brain are rejoicing in their new-found liberty and they make you think it’s all going to be easy. It’s wonderfully euphoric and it doesn’t last. I know I have some testing times to come but I know I won’t cave in. I know I can now go to gigs on my own without booze, can be on holiday without booze and go to bars with my friends without booze. And all of those times are still fun. More fun, even, because I’m not trying to stay to the end, or go on to another bar or have a seconds night out when my friends go home. I go home to my bed and sleep. In my first month I read voraciously – apparently it’s a thing, this obsessive reading about sobriety in the early days and weeks. After This Naked Mind, I moved on to Alcohol Explained by William Porter, The Sober Diaries by Clare Pooley and then The Unexpected Joy of Being Sober by Catherine Gray. Where Annie and William both gave me the science behind what I’d been doing to my body, Clare and Catherine put it into context. As women from media backgrounds, they’d both fallen prey to the ever-present alcohol. Their journey had been speedier than most as a result and their recoveries nothing short of epic. They reminded me of extreme versions of me and my friends and helped put everything I’d learned into a relatable context. My voracious reading is not unlike every other sober person I’ve encountered in a forum, including the order in which I read those particular books. That initial frenzy of content imbibing has now slowed and I don’t need to read other people’s stories any more, but I know they’re there if I need to go back (I read This Naked Mind twice). The reaction from my friends has been interesting – a couple of them stopped drinking as soon as they heard my news. Some reacted by immediately telling me how I was different to them – they didn’t drink that much, they could handle it, they like the taste, they could never give it up. One thing I’ve learned is that this is a deeply personal journey but one that does touch other people if you dare to share. I read in one forum that people are just waiting for permission to stop drinking, because the social rules are so strongly weighted towards it. If you mention you’ve stopped, pretty much everyone tells you what their relationship is to drink straightaway. They know it’s a problem. I have always prided myself on acting on choices – to not have children, to not stay in a loveless marriage, to remove toxic people from my life. Just because everyone else is doing something doesn’t mean you have to. The social pressure to join in drinking is perhaps the greatest pressure we experience in the west, along with to get married and have babies, to get a good job and a mortgage. Opting out is hard, which means we often keep it a secret. On my 50th day of sobriety I have decided to share my story – I don’t do secrets. (Well, maybe just a few, but usually to protect other people.) I’ll see you at the bar because I’m still going to be there. But I promise I won’t be making you stay until the end.